http://thefoolishobsession.com/category/brand/banrock-station/ Amazingly it has been four days since we last posted. I can’t believe how much faster time flies when you aren’t stuck in the same room all day. Thanks to our own corporate angel we safely arrived home on Thursday night to a pretty excited group of grandparents and our son. The flight was almost perfect again thanks to our talented pilots. The information that we were desperately looking for came right before we got on the plane in Boston. The Neuro Oncologist called with a ton of information for us to digest. The pathology of the tumor was back and confirmed that the tumor was what the doctors thought it would be a Pilomyxoid Astrocytoma. With this discovery came a lot of more information: the tumor was found to not be cancerous, it is not usually life threatening, it is a tumor that doesn’t morph into other types, and is a tumor that should be able to be controlled with chemotherapy, and if it is eliminated it doesn’t usually come back. On the more negative side we found out that the tumor is one that is not usually eliminated by chemotherapy. We haven’t actually had any discussions with the oncologists from Omaha so we don’t exactly know the course of action, but the oncologist from Boston share with us what he thought the plan of action should be. He said that with this type of tumor it is common for doctors to use a combination of two different drugs through a port that will be placed under the skin in her chest. The use of this port will make it easier for the doctors to administer the drugs instead of poking her every time she has to go in. 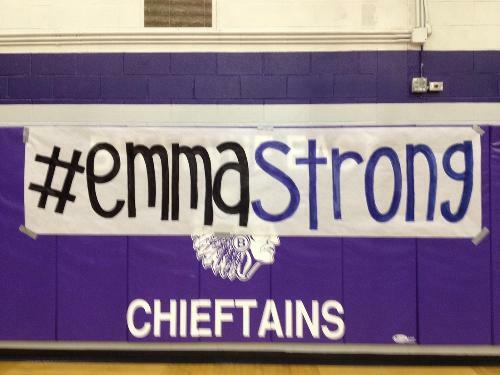 The schedule will probably be to have Emma get chemotherapy once a week, every week for a year. The expected results from this treatment will be for the tumor to stay the same or shrink a little during the year of chemo. It is unlikely that it would shrink a lot but it is of course possible. The doctor also said that after the year of chemo he would expect the tumor to stay the same for an average time period of two years. At any point if the tumor were to start growing we would have to start chemo again probably with the same schedule as before. We can only hope that instead of every two years it could possibly be four or five years between chemo battles. The overall goal is to keep the tumor under control until Emma is around 20 years old. The doctors aren’t sure why and they are currently doing a study on pediatric brain tumors, but they find that around the age of 20 these brain tumors become dormant and no longer grow or cause problems in the brain. They seemed very optimistic that this would be the case for our Emma. This weekend our family had the chance to be distracted from whats going on by attending the beautiful wedding put on by the Janssen and Burns families in Omaha. Aiden had the privilege of being a ring-bearer along with his good buddy London in the wedding. Both boys did extremely well during the ceremony and handled the situation very well. Aiden did share with me that the reason he was acting shy while walking up the aisle was because “he was a little bit scared” by all the people at the wedding. It was really cute to see him being so honest with what he was thinking. The weekend had its excitement for the Gehring family with a Saturday morning trip to the Children’s Hospital ER for possible issues with bleeding or infection. We were informed when leaving the hospital in Boston that throwing up and her being extremely tired are two things to be careful about. Kathryn and I had noticed from Monday to Friday that each day was a little bit worse and she was doing a little bit less each day. The doctors told us that the last blood draw in Boston showed that there were some counts that were out of whack and we needed to make sure that everything is ok. Our trip the the ER was made much more positive when the doctor had the idea to check her stomach with an X-ray to make sure that everything was being disposed of correctly. This X-ray showed that Emma was extremely plugged up and this was probably the cause of her pain and lack of energy. An enema quickly took care of a large portion of this issue and things have been going fairly well since that time. By Sunday night Emma had started to jabber with us and became much more interested in playing with toys. It was a wonderful feeling to see her smiling and having fun with her brother and parents. We missed that the past two weeks. Hopefully this will continue to get better as we go through the next couple weeks waiting to start chemo. I will wait to share more information about the possible issues caused by the chemo until we talk to the oncologist from Omaha about their exact plans. Thank you for the continued prayers and random acts of kindness. It helps us get through the daily activities we face now. 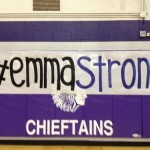 We are looking at possibly doing all updated about Emma on her EmmaStrong.com website in the future. So if you would like to check that out in the next couple days we would appreciate it. We have a little more freedom to do more interesting things on a website that we control, so I am looking forward to that possibility coming forward. I will be copying this entry to the Emma Strong website as well. As soon as we figure out an efficient way to allow status updates through emails we will seriously consider moving to that site permanently. I cannot even begin to thank a few certain people out there for what they have done over the past couple weeks. Many of you have take time out of their days to make my families transition easier. Each one of you know who you are and we deeply appreciate everything you are doing. Look for the next update to come when we hear from the doctors in Omaha or the PT’s and OT’s in the area. God Bless each and every one of you. http://cinziamazzamakeup.com/?x=vardenafil-senza-ricetta-Lazio Your email address will not be published. viagra pharmacy uk cialis online This site uses Akismet to reduce spam. Learn how your comment data is processed.